Morning in Chicagoland. Enjoying breakfast on a deck in a quiet neighborhood. I’ve come so far on this trip. Boarded a train in Little Rock. Changed trains in Chicago to go to Washington, DC, for a business meeting. From there a train up to New Brunswick, NJ, and friends. Then a regional train into New York City and another friend. Next a train ride along the Hudson River (spectacular) and through the night to Chicago, duplicating my very first train ride in the US, 37 years earlier. A lot of experiences and impressions in a little over a week. Now I’m relaxing, hanging out with Bob and Debbie in Chicago for a few days. 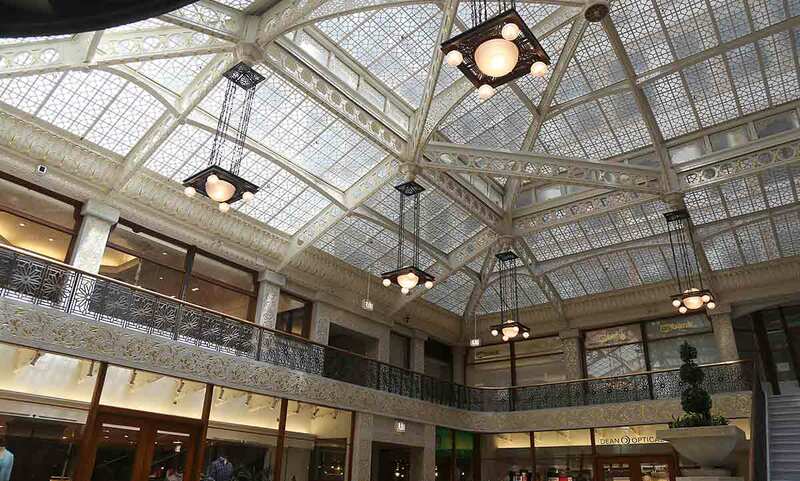 I brought a list about a mile long of things I could and would like to do while in Windy City. Probably would take about a month to do it all. After some conversation with my hosts, things get narrowed down and a plan is hatched for how to best spend the next couple of days. Today, Debbie and I take the train into the city. 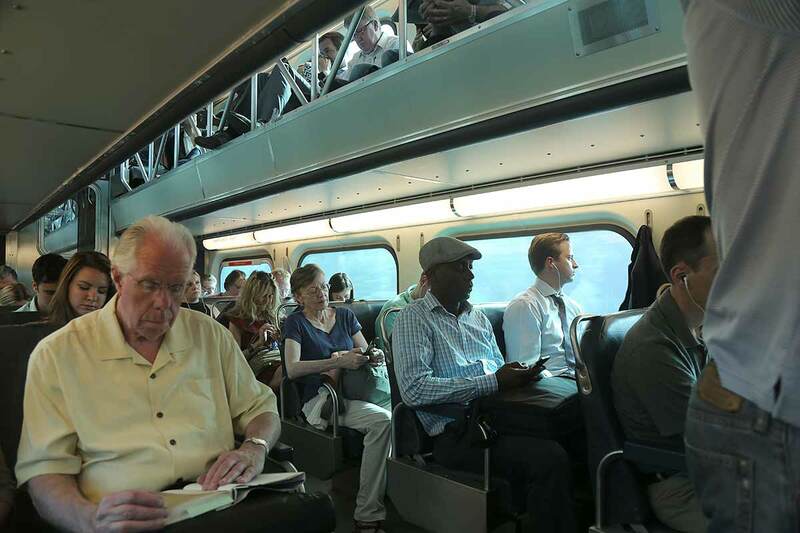 The Chicago bi-level commuter cars are definitely unique with their gallery design that allows the conductor to check tickets on both levels at the same time. Some of these bi-level cars have been in service since the ’70s or longer. In Europe trains in regional service like this would have been through 2-3 generations of equipment by now. But we have an odd relationship with infrastructure in the US, so we don’t fund it or upgrade it in the same way. Rather keep on doing the same old stuff. Come to think of it, if Metra was in Europe, it’d likely be all electric by now, allowing for shorter travel times and more frequent schedules. We’re on the train because Debbie offered to take me on a tour of the Loop. She worked downtown for many years and so knows her way around there far better than I ever will. Soon we are wandering through the streets, marveling at architectural details on buildings, at street level, high up where most people never think to look and down alleys that are so narrow, no sunlight ever makes it to the ground. As if the exteriors of many buildings are not interesting enough, Debbie takes me inside some of them to discover new layers of treasures. We’re both avid photographers and it intrigues me what we each point our cameras at. She’s seen it all a million times. For me it’s been decades since I was in the area and much of this I’ve never seen. Makes me wonder how that will reflect in the pictures each of us takes. Last time I was downtown Chicago, there was no Millennium Park. So a stop at the Cloud Gate (Bean) is a must. 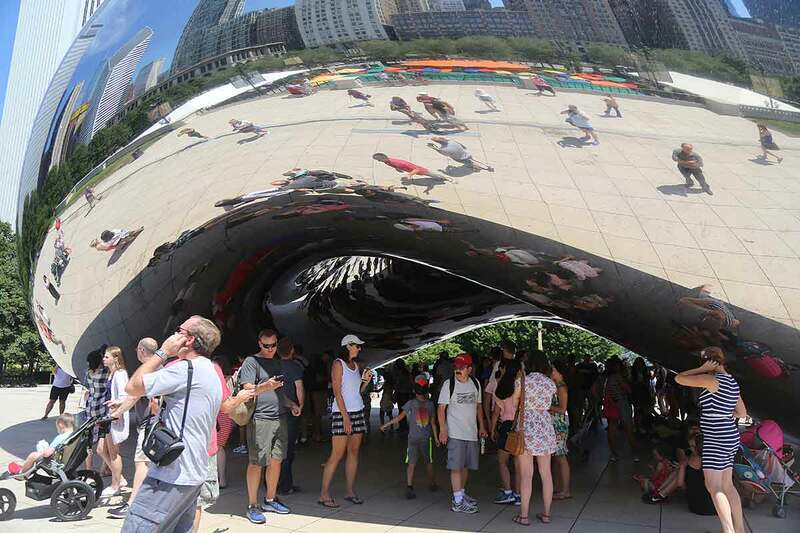 I actually thought it was just a big, shiny metal bean sitting there. Then I walked up to it. Take a step this way or that way and the reflected images change. You can stay there for a long time, exploring the ever-changing view. Then a stroll on the new River Walk along the Chicago River. This is a lesson in how you make a city livable: Take a polluted river, clean up the water, build a walk along it that creates pleasant space to be in and suddenly there’s an entirely new resource to draw people downtown. We top the day with a ride on the L (because you can’t come to the Loop and not ride the L) and then the train back home. The next day I head outside Chicago, beyond the far west suburbs. I’d booked a rental car, but Bob and Debbie insist I use their van instead. 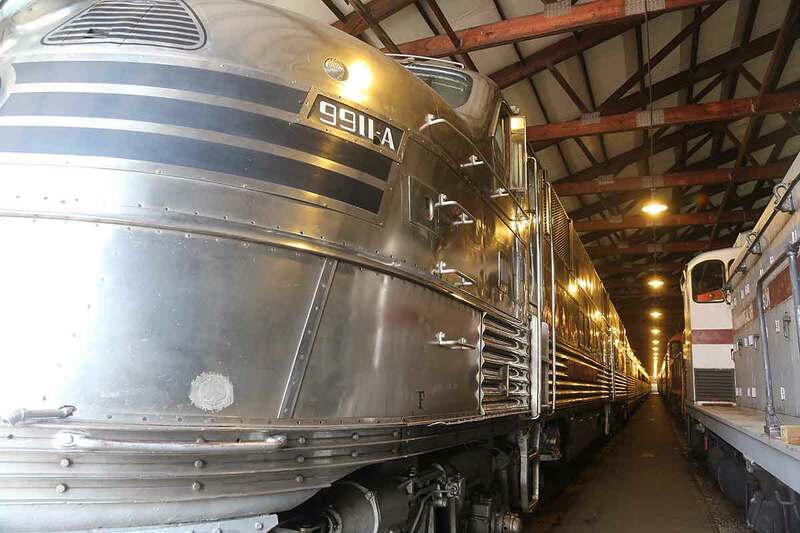 The Nebraska Zephyr, preserved in all its stainless steel glory. This train, still in operational condition, was originally built in 1936 to run between Chicago and Minneapolis-St. Paul. In 1947 the trainset was reassigned to the Chicago – Omaha, NE, service where it ran until 1968. For part of day I head to the Illinois Railway Museum in the small town of Union. I was here last in 1979 and they have seriously expanded since then. Here is a massive collection of locomotives, passenger cars, street cars and interurbans. Many of them are quite operational, on track that belongs to the museum and on excursions in the area. I could probably spend a couple days here to see it all, but enjoy all I can and promise myself to not let it be several decades before I come back. When trains were pulled by steam engines, those locomotives needed to be resupplied with coal every so often. 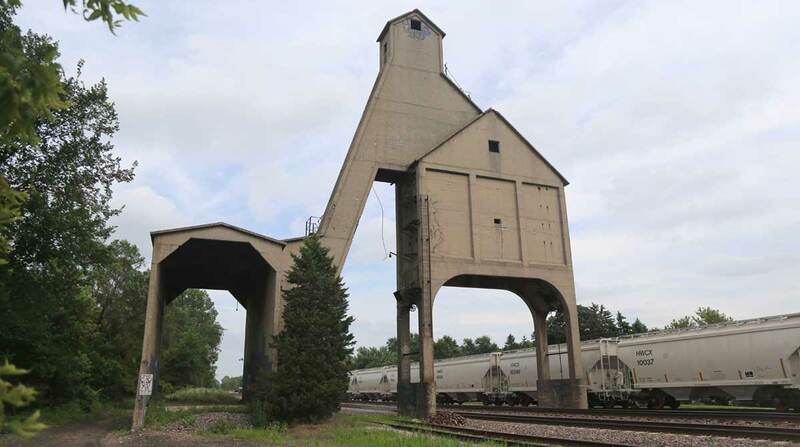 The coaling tower in DeKalb, IL, could dump tons of coal into the tender of a locomotive on the main track under it in a matter of minutes. Today the functionality is long gone, but the structure still stands. In late afternoon I stop in DeKalb, IL. It’s a university town on the Lincoln Highway. The Union Pacific main line from Chicago to Iowa and points west goes through here. The reason I’m here is a behemoth of concrete near downtown: An old coaling tower from when steam engines pulled all the trains. Long robbed of its function, it still straddles the main tracks today (too costly and disrupting to demolish it), even though it hasn’t fueled any locomotives since the 1950s. My goal is to get some pictures of it from different angles. Just because I find it intriguing and there’s a sort of charm to decaying industrial edifices in the landscape. The day in the Illinois countryside is very enjoyable. Farmland like I grew up with in Sweden and lived around in Iowa. Something about the fields, farms and big sky. If I was a hobbit, I’d lie down in a pasture by the roadside and take a nap. All good things must come to an end. Trips consist of traveling out and traveling home. The next morning I get my backpack ready for the last time on this trip. Debbie decides she’s driving me to Union Station, but first a detour to the beach. There are lakes and then there are the Great Lakes. Large enough that quite big ships come onto them and definitely large enough that you can’t see the shore on the other side of the lake. It feels like the sea. Except the water is not salty and there’s no surf. No matter. Having grown up on the coast, I love walking along the water’s edge, so this is a real treat. Then we head towards the station, going down Lake Shore Drive and the Magnificent Mile before negotiating through the Loop area. At Union Station, Debbie pulls over on a corner (not a chance at parking along the street today). I put my backpack on and we say our goodbyes. I watch her car blend into the traffic as I head into the Great Hall. Timing is great. Not that long before my train will board. By now I know the routine: Line up in the Great Hall. Then all, like a giant row of ducklings, walk down to the departure track where my old friend, the Texas Eagle, is waiting. Soon I’m seated in a Superliner coach and the train rolls out from the station, past the rail yards, over bridges, through industrial areas and miles of suburbs that seem to go on forever. I’m reminded of when I was in college in Iowa City and my aunt and cousin from Sweden came over to visit. I picked them up at O’Hare Airport in the evening. They were amazed at the size of the city and wondered how long before we’d drive out of it. Of course by the time we were past the far west suburbs and passed DeKalb, they were fast asleep. The train stops in Joliet. People getting on. 2 Metra lines meet and end here. Chicagoland is now behind me. When I came to Chicago from Little Rock, the Texas Eagle was detoured due to track work and took a different route. Today the train is going the normal way to St Louis, down the straight and upgraded speedway. For much of the distance, Interstate 55 runs right along the train tracks. This is also the old Route 66. I watch cars getting left in the dust as the train zooms along. This may be the train towards home, but the trip isn’t over yet. I make my home in the lounge car and work on writing, while enjoying the countryside passing by outside the windows. To many, the relatively flat Midwest is boring, hardly worth a notice. Having grown up in a farming community in the breadbasket of Sweden, I love looking out over the fields, all full of crops, with farms scattered throughout it. It’s rich land that feeds the country. The train stops in Bloomington, home of Illinois State University. The Amtrak station is just a few blocks from the campus. How much more convenient can transportation get for college students? I think of all the students from Chicago who were at University of Iowa when I was there and who had to drive home for the weekend or count on the Greyhound bus. I wish every college campus had a rail connection for students to get home. 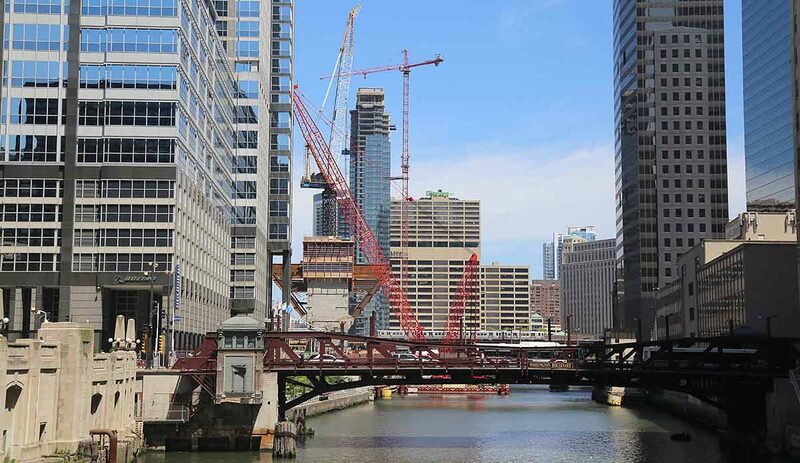 The Chicago – St Louis rail corridor has been majorly upgraded over the last 8 years. Now much of it is a speedway allowing passenger trains to zoom along at up to 110mph. Passing tracks have been added and road crossings closed or made safer to allow higher train speeds and better flow with fewer delays for the mixture of passenger trains and freights along here. This will help to significantly trim the travel time between the 2 end points and also cities along the route. 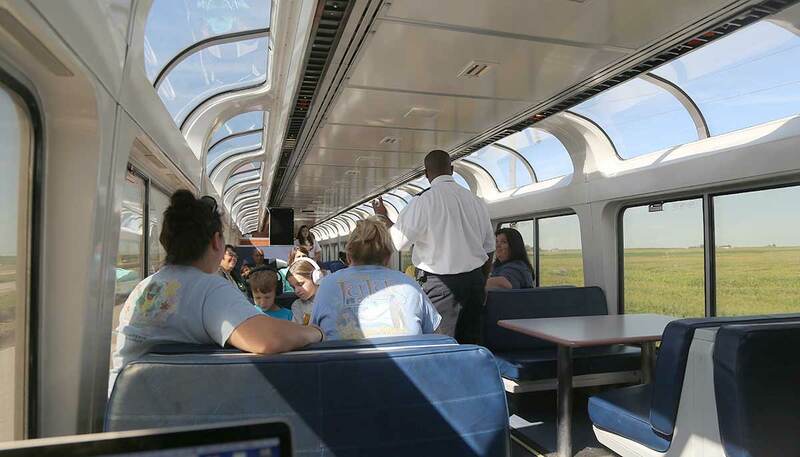 The corridor is used by regional trains from Chicago to St Louis, as well as the Texas Eagle that continues on to San Antonio (and Los Angeles). I’m in an early seating in the dining car and head over there. I’ve just sat down when a few women and a large group of energetic girls arrive. Some of the women get seated at my table and I soon learn that they are girl scout leaders who have been to Chicago with their group of girls for about a week and are now on the way home. This leads to an animated conversation about what you do with that many girls in Chicago. What are the sights that must be included? What adventures have they been on? Obviously it hasn’t worn out the girls who are busy talking, dashing between tables and having fun right to the end of the trip. Pretty sure the coach this group was in will be a lot quieter after St Louis. Crossing the Mississippi is another mile marker. Getting closer to home. After its stop in St Louis, the train heads south into the Missouri night. Like every other day on the trip, I call home and talk with my bride for a while. There’s so much to catch up on. I check on the Amtrak app on my phone how the train is running. Looks like we’ll be late coming into Little Rock. That’s perfectly okay. For one thing, my daughter won’t have to get up so early to pick me up at the station. For another, I get to sleep a little longer on the train. Trains at night are kind of funny. With all darkness outside, it feels like the train is standing still (although with a gently rocking motion) and the world outside is doing the rushing by. There’s a steady sound of blowing air outside the window. Inside the train it’s quiet hours. No announcements over the PA system. Overhead lights are off and only very dimmed lights give some form to things. And people do settle down and go to sleep. Even the kids. With all being dark, it’s also very difficult to tell where you are. If it weren’t for my phone’s GPS, I would be hard pressed to know that we were coming close to Little Rock. Of course there’s the long approach through the rail yards in North Little Rock and then crossing the river to slow down for the station stop. By then I’ve once more grabbed my backpack off the overhead shelf, swung it onto my back and am headed downstairs to the exit door. As I step out on the platform and walk along the train, I look around. All so familiar. Seems like I was just here to get on a train going the other direction. Was I really gone or was it just a dream? That’s the thing with travel: It’s very much here and now as you’re doing it. A very present thing. And then it’s over and it’s all memory. Good memories. But memories. I’ve had time to reflect while on this trip. To review, to make some plans. I’m excited about seeing how things will eventually turn out. So glad I was able to make this journey. I had ideas of what it might be like when I started planning it and in the end, it came out very differently, but so much better. Things often work out that way in life: We make a move, take a step or two, and then things start to unfold in ways and places we never imagined. As I walk through the parking lot to where my daughter will pick me up, I look back at the train, getting ready to depart. Its journey goes on. Mine is ending and yet, because of the journey I just made, things will never be the same. Life is precious and life is good. When you’re visiting friends, do you count on them to set the schedule and have activities planned or do you make your own plans? When you’ve been on a trip and it’s time to head home, do you stay in a travel frame of mind, gathering in impressions until the very last moment, or do you shift into a mode of mentally already being home and on to the next thing?